Did you know that Hoffer turbine flowmeters are used in the brewing process by an Internationally recognized company with a significant share of the beer market? While the actual ingredients used in the brewing process have not changed significantly over the years, automation of the process and state-of-the-art control capability have provided for exacting standards that provide for superb product quality control. A critical part of the brewing process occurs after “mash” has been created. This mash, consisting of water and grain, is transferred to a settling tank referred to as a Lauter Tun. The Lauter Tun, a large diameter flat bottom vessel, is used to separate the wort, the sugar solution, from the grain. Inside this Lauter Tun is a rake which is used to stir and level the grain as it settles to the bottom of the vessel. The rake is operated hydraulically using filtered pure water. The Hoffer turbine flowmeter is used to monitor the filtered pure water flow. The use of the filtered pure water is for sanitary reasons, which assures that if a leak were to occur in the rakes hydraulic system, the only thing that could make contact with the wort would be the pure water. Once this separation is completed, the wort is pumped out of the vessel for fermentation. Cleaning water is added to the separator vessel and the rake once again stirs the grain as the water and used grain are pumped out. The cleaned vessel is then ready for the next batch. The specifying engineer at the brewery selected the 1″ Hoffer turbine flowmeter for use on the pure water hydraulic flow application. Hoffer was specified due to the need for high accuracy and repeatability over a wide flow range. The repeatability and accuracy at the low flow rates are particularly critical because the flow is alarmed for low flow conditions. This allows the customer to check for a leak in the system or a possible malfunction should an alarm occur. 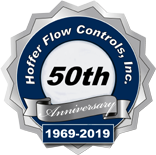 Another important feature of the Hoffer turbine flowmeter is the all stainless steel construction to maintain the high purity level of the water. All lines in the hydraulic system are also stainless steel. Multiple 1″ Hoffer flow systems have been installed in this large mid-western brewery for this critical application. After straining is completed, the brewing process continues on to kettle brewing, cooling, fermentation and finishing. Beer is “big business” and to give you an idea to what extent, check this out. 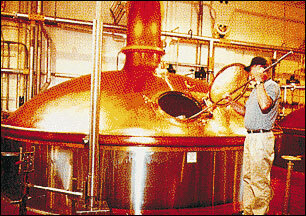 16 million 12 ounce beers are produced on an average day by this large mid-western brewery. That’s a lot of brewskies!